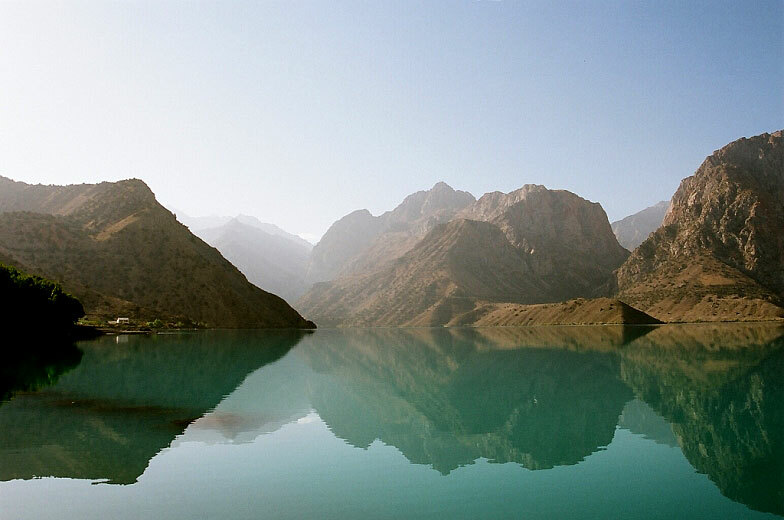 Iskander-Kul is a stunning alpine lake of glacial origin in Sughd Province of northern Tajikistan. Located at an altitude of 2,195 m on the northern slopes of the Gissar Range in the Fann Mountains, it is the highest in the range. Triangular in shape, it has a surface area of 3.4 sq.km and is up to 72 m deep. Widely regarded as one of the most beautiful mountain lakes in all of the former Soviet Union, it is a (relatively) popular tourist attraction, the most visited spot in the Fann Mountains by far. 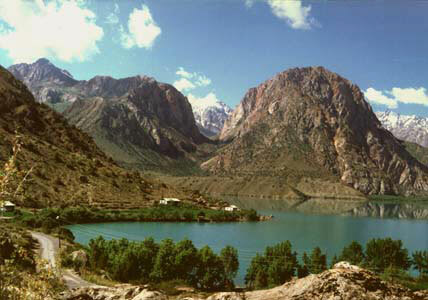 According to tradition, the lake takes its name from Alexander the Great: Iskander is the Central Asian pronunciation of Alexander, and Kul means lake in Tajik. The scenery around the lake is so rugged and picturesque that it defies description. Huge towers and ridges of rock rise to 4,000 meters, nearly two thousand meters above their reflections on the serene surface of the lake; most of the year the forbidding summits seem even more surreal sporting a fresh coating of snow, though the glaciers have retreated out of sight. The turquoise lake water offers an impressive contrast to the red rocks of the mountain slopes. (The Fann Mountains consist mostly of folded limestone, in which are oxides of iron which become rust colored when exposed to air). The highest of the (visible) surrounding peaks is Mount Kyrk-Shaitan at 3,950 m. Although the bluish-green water is very cold, fed by the Sarytag, Hozormech and Serima rivers, it is possible for hardy individuals to have a refreshing swim in late summer. In winter, the lake freezes nearly solid, its icy surface covered with a heavy blanket of snow. All along the water's edge, thickets of willow, barberry, dog-rose and buckthorn crowd each other; birch, aspen and juniper groves surround the entire lake. The Iskander-Darya River, originating from the lake, one kilometer below its source ends in a narrow gorge by plunging down a powerful 38m waterfall (sometimes called the "Niagara of the Fanns"). It is possible to view the cascade up close, though it is a dangerous climb up loose scree slopes. Near Iskander-Kul sits "Snake" lake, named for its abundance of snakes, and above the lake a narrow canyon creates another beautiful waterfall, though it can be difficult to access. 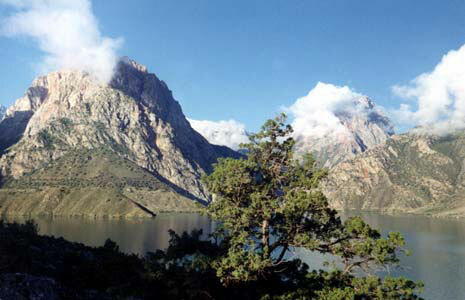 A diversity of wildlife inhabits the vicinity of the lake, including bears, snow leopards, mountain kuropatki, and wild turkey, though the lake itself is nearly devoid of life. Many legends are associated with this lake. According to one of them, Alexander the Great (for whom the lake is named) himself rode through the Fann mountains once, and during their stay on the shores of the lake, the favorite horse of Alexander, Butsefal, drowned. Another legend states that in ancient times Alexander conquered the rich lands of Sogdia, then located among these regions. However, the freedom-loving highlanders did not accept and mounted constant guerilla attacks, worrying the Greek army. An irate Alexander ordered the damming of the river, next to the capital of the Sogdians; this formed a large lake, forever entombing the fortress and its brave defenders in the depths. 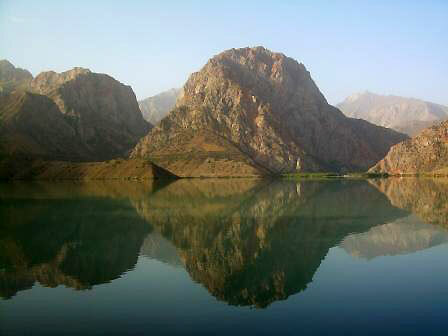 In fact, Lake Iskander-Kul originated in an ancient glacial valley, at its base are moraine deposits from avalanches and landslides. But the surrounding residents and travelers prefer an old legend to dry scientific explanations. The pure scenic grandeur of the surroundings in fact makes one indifferent to the geology of the majestic site. The route to Iskander Kul is via the Dushanbe-Khudjand highway, which winds its way up and down the high Anzob pass (3375 m) to the south, and Shakhristan (3378) to the north; the area is also accessible from Penjikent in the west. The route from either pass careens steeply downhill through massive debris piles caused by the collapse of old glacial lakes. All around are magnificent views of peaks, and quaint villages which look as if they've not changed in a thousand years. The road follows the Yagnob valley to its confluence with the Iskan-Darya, where a rough road leads 20 km up a narrow valley to the lake. The road surrounds the lake on three sides, and there are several old cabins located there. Trails lead from the lake up several valleys, including one way to peak Chimtargan (5,489), the largest in the Fanns. A legendary and very difficult route goes over several high passes around Chimtargan to the gorgeous "Seven Marguzorskih Lakes", on the road to Penjikent. Just before the merger of the Yagnoba with the Iskander-Darya, brilliant red rock outcrops sit close to the highway, in which are clearly visible black seams of coal. This is the largest coal deposit in Central Asia, which has not yet been developed due to the inaccessibility of the area. But here you can observe a rare natural phenomenon - underground coal fires. Smoldering underground for centuries, the burning hard coal has produced gases, reaching three hundred degrees. Noisily, but without visible smoke or flames, these gases seep up through rocky crevices and caves. The walls of caves in this area are covered with crystals of sulfur and ammonia, and the soil near the cracks is so hot that it is possible to roast meat, bake cakes or boil tea on the stones.